...to losing money. Apart from this book, I have no books on handicapping. Let me give you a biography of my life in betting to explain how I came to own this door-stopper. Once a week, when I was a young child, my father would call out to me and ask for numbers between 1 and 55. Eventually, I wanted to know what for. I asked and was told that my father was filling out a thing called a football pools coupon. He was selecting draws, before the days of personal computers and calculators, using a random number generator. Me! This got me interested in numbers and probability from a very early age. How was I influencing the course of a football game by guessing numbers between 1 and 55? When I turned 16 years of age the ZX81 had started to usher in the UK home computing craze. I asked for a ZX81 on my birthday, because "it would help me at school". Well, it helped me to swap computer games at school but little else. One piece of software that I got for the computer was a pools prediction program. Of course, it didn't predict anything. Nor did the Course Winner horse racing software I bought a year later for the ZX Spectrum that I had upgraded to. My horse race betting activity, during the 1970s, consisted of betting each way on Red Rum for the Grand National. Five bets, five wins. I thought I was a genius. I didn't have any real knowledge about horse racing (I am no more clued-up today) but I wanted to know more. One day, I was in WH Smith and noticed Braddock's book. I snapped it up, imagining untold wealth. I fiddled around with writing BASIC programs based on some of the nonsense mentioned in the book but gave up after a week. A few years later, I came across The Punter's Revenge and so finally, I was on the straight and narrow (but incredibly long) road upon which I find myself today. This afternoon, wanting a little reading material to read whilst sitting on the porcelain library chair, I noticed Braddock's book and thought I would look at it. What nonsense I read! "Never bet odds-on." and "level staking is the only sensible form of betting" were some of the wise words to be had. 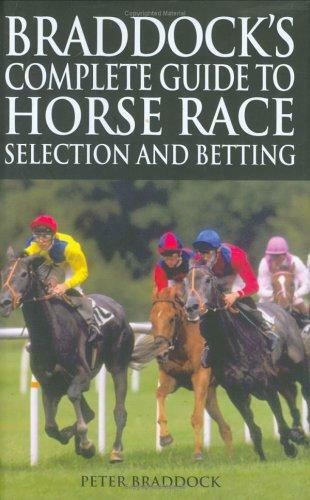 There was, of course, all the usual nonsense about selecting one horse over all others to win the race. Who cares?! On looking for a picture of the book on Amazon to decorate this posting I was flabbergasted to see that Braddock's book is still in print after all these years and updated too. I looked at the contents on Amazon and it's the same book! Well, there are 9 additional pages on bet exchanges. I can't imagine what Braddock makes of Betfair. If I ever see a copy I will take a look but you can be sure I won't buy the book. A dinosaur of a book for a dinosaur age. I have no books on form or handicapping. Everything I need to know about a horse is already in its somewhat efficient price. I don't care who owns the horse, who trains or rides it. I don't even care if the nag has only three legs. If it's the favourite then it must be a damn fine horse to be running on three legs! With the price, standard economic principles and a peer-to-peer betting exchange, we can get to work on turning a profit. Form is irrelevant.